On the evening of Wednesday, August 3rd, Traver Gallery will debut two new solo exhibitions and one new permanent one. John Kiley will be unveiling "10,000 MPH," a radical departure for this seasoned glassblower and cutter. Also opening is the work of up-and-coming conceptual artist Justin Ginsberg, who will exhibit his work in an exhibit entitled "What is Known is Uknown." 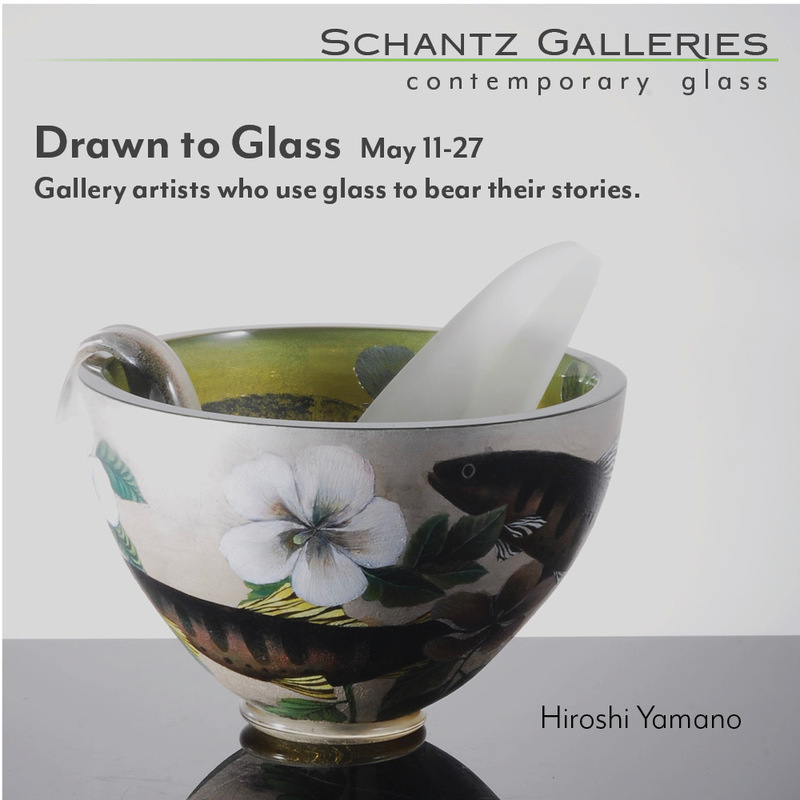 The two are working to "push the (glass) medium to absolute extremes" in their new works, according to the exhibition announcement. Kiley is known for his colorful and imposing sculptures of geometric works strategically bisected to interrupt symmetry yet create another kind of logic. In his latest sculptures, the dissonance is stronger, with the dense shatter-pattern bringing forth the idea that "beauty is revealed in the broken," as cited in the announcement. Ginsberg is known for his willingness to push glass into uncharted territory. 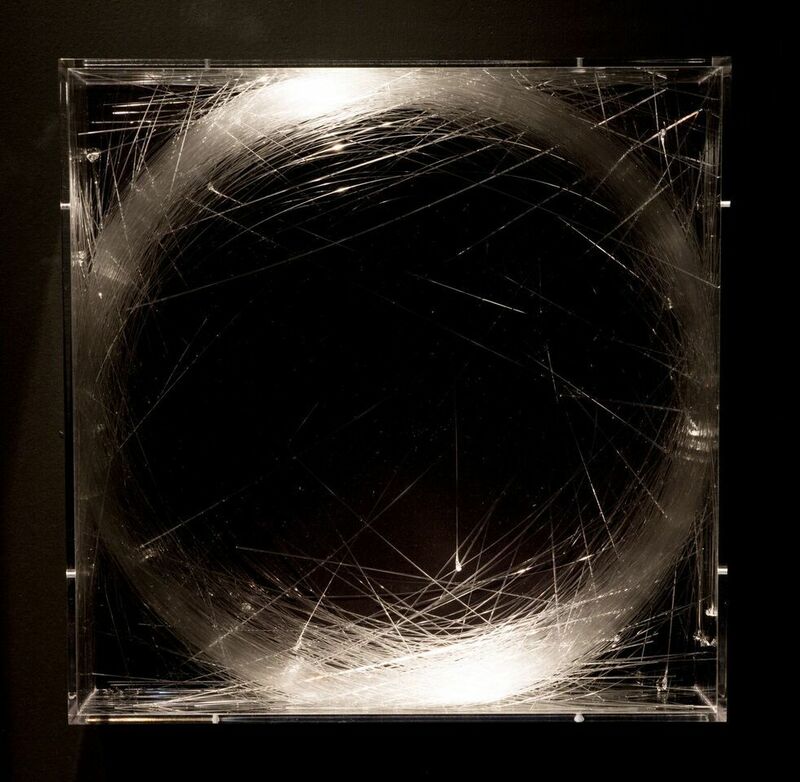 His latest work features handmade coils of glass displayed seemingly in motion, with minimal lighting to give his pieces a dark, compelling feel. 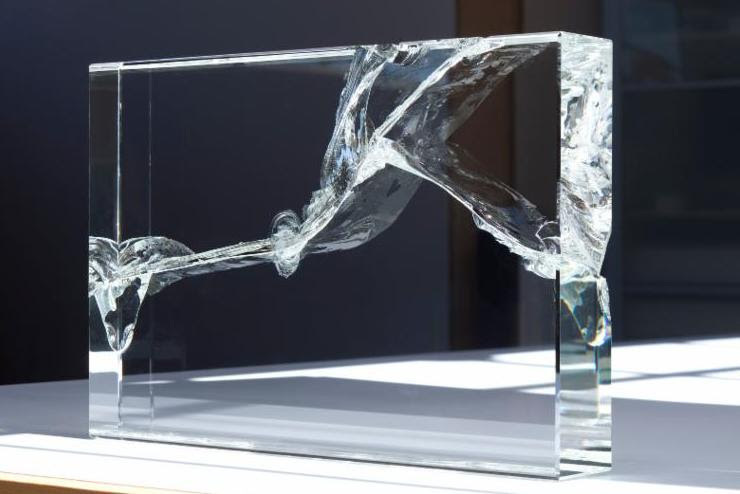 The two combined solo exhibitions are working to challenge their audience, and make them appreciate glass artworks that are atypical, or "other," in their style and ideas. Both exhibitions are described as experimental. 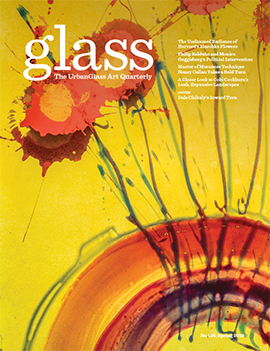 Kiley's work has been featured on the cover of GLASS Quarterly's Winter 2012 Issue, while Justin Ginsberg has been featured in the more recent Winter 2015 Issue. 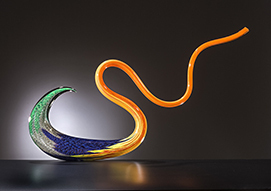 A Seattle native, Kiley began his glass career at the age of ninteen at the Glass Eye Studio, and he soon went on to be a member of Chihuly's team, traveling the world with him. His own works have also been displayed in galleries around the world. Justin Ginsberg got his MFA at the University of Texas, and he continues to teach there as well as at the Pilchuck Glass School. In his article about Ginsberg, GLASS contributing editor John Drury compares his style of glass blowing is similar to the early "Studio Glass pioneers" approach, by pushing the material to it's very limits. Also opening on August 3rd at Traver is a dedicated area of the gallery that is named the "Lino Space." Solely dedicated to artist Lino Tagliapietra's work, the exhibition will rotate continually, but it will be all Tagliapietra, all the time. This "space" within the Traver Gallery has been a long time coming, with Lino and William Traver, the owner of the gallery, having a partnership spanning over thirty years. It began with Traver giving Tagliapietra his first solo exhibition in the United States at the very beginning of his artistic career. He has gone on to become one of the best-known artists working with glass. The combination of Kiley, Ginsberg, and Tagliapietra will certainly invigorate the Seattle art scene this late summer. To be there for the opening exhibits of all three arists, visit the Traver Gallery between 5 PM to 8 PM on August 3rd. Justin Ginsberg, "What is Known is Unknown"